Looking for a white party dress or a white formal gown? 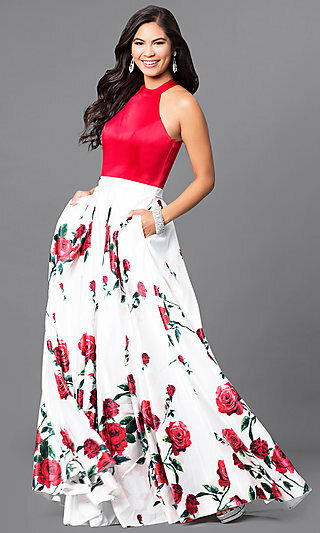 Whatever your upcoming event, this collection of white dresses includes women’s formal dresses in white and cocktail dresses in many styles and designs. There are classic white ball gowns, white bridal dresses, v-neck white party dresses, and short white dresses for graduation. Find gorgeous long white evening gowns with floor-sweeping voluminous skirts and short white formal dresses with tiers or mini skirts. Why not pop with a bright print? A light background gives white formal dresses with contrasting floral designs an irresistibly bold look. An all white dress for graduation, a white ball gown, or a white bridal gown can be the just as exciting with a subtle hint of sparkle from sequins. For all different special occasions and style preferences, there are white dresses to adore. Let Simply Dresses help you find your ideal white long evening dress or short white formal dress. Where Can I Wear a White Dress? Formals - With elegant appeal, white formal dresses leave a lasting impression with a clean style from head to toe. Any embellishments, embroidery, prints, or additional details really pop on white evening gowns, making them a stunning choice for black-tie events. Graduations - Pass with flying colors, while sporting just one, in a beautiful white dress for graduation. Blending well beneath the caps and gowns, white dresses have a soft style ideal for the big ceremony and are even required by some schools. Pick a little white dress with a short breezy skirt and flow across the stage with grace. Date Nights - New love interest or old flame? White cocktail dresses help you seem cool and collected for special dinners and date nights. Feel confident with white dresses that cradle the curves and replace jewelry with rhinestone-embellished necklines. Parties - Highly fashionable, and flirty when fitted, white cocktail dresses are an excellent option for all different types of parties. Go with modest long-sleeve white dresses or white dresses with high necklines if it’s a family celebration, and slip into a slender-cut white party dress if you’re meeting up with friends. Rehearsal Dinners or Receptions - Tying the knot? White dresses celebrate the bride’s special role at rehearsal dinners, and white formal dresses have the same effect at receptions. Seamlessly transition from the wedding to the reception wearing a formal evening gown in white. These days, it’s possible to wear white dresses to show off a confident style at almost any special event. If you’ve heard the old “rule” about not wearing white dresses after labor day, rest assured that today, white dresses are a year-round wardrobe staple for graduations, parties, and formal dances. With this collection of white dresses, choose from alluring white formal dresses and playful little white cocktail dresses. Shop the white long evening dresses, white formal ball gowns, and white dresses for graduation here at Simply Dresses to get you started.